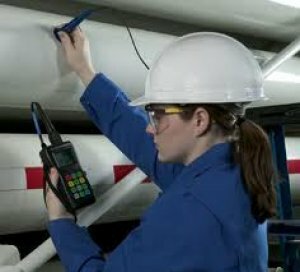 Application: Accurately measuring remaining wall thickness of metal pipes, tanks, beams, ship hulls, and other structures through paint and similar coatings. Background: In many industrial and petrochemical maintenance situations it is necessary to measure the remaining thickness of metal that is subject to corrosion through one or more coats of paint or similar non-metallic coatings. With conventional ultrasonic thickness gages, the presence of paint or similar coatings will cause measurement errors, typically increasing the apparent metal thickness by more than twice the thickness of the paint, due to the paint's much slower sound velocity. Two solutions to this problem are available: echo-to-echo measurement and Thru-Coat measurement. This Coating Thickness Meter is an ideal gauge for automotive and painting applications.It uses magnetic induction and eddy current principle to measure thickness of magnetic and non-magnetic surface and detect the thickness of nonmagnetic coating on a magnetic substrate (ferrous, F) or an insulating coating on a non-magnetic conductive substrate (non-ferrous, NF). The TIM001is the most popular ultrasonic thickness gauge sold in Australia. It is a low cost, hand-held microprocessor controlled thickness gauge specifically designed for measuring the thickness of metallic and non-metallic materials e.g. aluminium, titanium, plastic, plastics, ceramics, glass and any other good ultrasonic wave-conductor as long as it has parallel top and bottom surfaces. 1. Capable of performing measurements on a wide range of material, including metals, plastic, ceramics, composites, epoxies, glass and other ultrasonic wave well-conductive materials. 2. Transducer models are available for special application, including for coarse grain material and high temperature applications. 3. Probe-Zero function, Sound-Velocity-Calibration function. 4. Two-Point Calibration function. 5.Coupling status Indicator showing the coupling status. 6. Battery information indicates the rest capacity of the battery. 7. Auto sleep and auto power off function to conserve battery life. 8. Optional software to process the memory data on the PC. 9. Optional thermal mini-printer to print the measured data via RS232 port. 10. Adjust gain function ,can easy to test the cast iron material.